Thank you all SO much for the name suggestions, you don’t even know how much it helped! Drew and I literally had two names that we could think of that we even remotely liked, and now we have a huge list of the most darling names to go through! You are the best and I can’t wait to share which name we choose very soon! Hoping this look will brighten your Tuesday morning! Hi Rachel, you look gorgeous ! How about Romi ? This name is becoming very popular again here in Paris. Such a gorgeous dress! I love how you styled it with the pop of color and leopard! Perfect! Love the look of these two bright colors together! Great bright colors! It’s perfect for spring!! What a fun color! I’ve had my eye on this dress for some time :) Beautiful! Love these colors together so much! Beautiful look! Love your look! It really makes me want a summer drink! haha It’s so bright and fun! What a fun color combo! And Dash is getting so big! Loving this look on you, you look so beautiful ! great dress! love how you accented it with the pink! Such a lovely and fresh color! Those heels are perfect to it! That dress is SO fun, and I love those heels! I love this bright look Rach! Very pretty! I was on the fence about sharing my favorite baby name, but I’ll share it with you and everyone. I think it is kinda unique, and I already treasure it for some reason. It is the name I’ve already picked out if I have a little girl someday. ARIA. Definitely one of those names that you’ll immediately love or pass on. Can’t wait to hear what you and Drew decide on! Love the color combination!!! So fun and perfect for Spring/Summer! Good luck picking out a name! These two colours look gorgeous on you Rach. Can’t wait to find out which name you choose. You and your baby bump rock that dress! Love the accessories with it! You look great in bright colors! They really pop against your long, dark hair. I’m excited to hear the baby’s name! Obsessed with the lime! And it’s not too bright – perfect for spring. I love the bright colors! You look fab and such a chic mama to be! LOVING this dress! SO stunning on you! You always style bright colors so well! I can’t wait to hear what name you and Drew end up picking! That color combo is perfect! Love this outfit! Love this color combination! So fresh for spring! You totally rock the neon dresses, tops and shoes!! I love those pink heels, so pretty year round! Yay! Picking the name is the most exciting part! Congratulations! That dress is amazing!!! This makes me wish I could pull off that color! It looks great on you!! Pretty dress! I love the pop of pink in your lips and shoes. Quinn Olivia is our daughters name and we love the uniqueness of it!! Good luck! I LOVE this look! You are the most darling pregnant lady ever! Love this look! Love the bright colors. So refreshing for spring. Hey Rach! You look so gorgeous in this color combo. Harper, Ava, Juliet, Emerson, Violet, Elle/Ella, and Viviane are my fav girls names right now! you are rocking this look — I love that you’re still wearing heels! This color is so great on you! I love it with the raspberry, and I also love it with turquoise. I can’t wait to see which name you choose! I love this look!!! You look amazing as always!!! you’re so close! this is gorgeous! POP POP POP of colour, love this look Rach! I honestly didn’t know you were having a little girl! So exciting! I have loved seeing all of your maternity looks. My daughter’s name is Brielle and I think it is the most beautiful name in the world. I also have nieces named Anya, Emma, Lara (not Laura) and Kylee. I’m glad you were able to find some name inspiration! You look amazing and I hope I can keep myself as stylishly put together when I’m pregnant one day. You are just the queen of color combinations! This is perfect! Gorgeous color on you. You look beautiful in it. I love how you rocked this! Your style is so fetch. Where did you get this from? I saw something like that at this boutique called http://www.fixateboutique.com last time I shopped there. Did you get it from there? Wow!! Each! You look so beautiful!! Random question do you wear anything under to help your back side looks better? I am 21 weeks pregnant with a baby boy. I want to try the Spanx maternity line. What do you recommend? You’re so lovely! Great color on your skin and with your hair color! I always wary of bright colors, but you just look amazing! You looks fabulous! I love those two colors together and with the leopard clutch. What size of this dress did you get since you are pregnant? I love the different colors in your outfit! So cute!! I feel like not many people can pull off their color, but you pulled it off perfectly! Love the lime green with the pink shoes! I would have never thought of that combo but you make it look it work! Love! What a hot mama! Choosing a name is so exciting! I have followed your blog for a while now and have never left a reply. You’re amazing and so is your style. I just had to reply because I just recently heard 2 of the cutest girl names… Delayni and Cadence…best wishes. Hope you are able to narrow down the list! I’m sure you were given a ton of names! Love the puppy photo bomb! Looking good as always, Rach! Love these colors together and can’t wait to hear what yall decide! You look absolutely stunning dressed in lime. Perfect look to dress a bump! You look so cute and I love the way that lime fress fits you. You’re literally the prettiest preggos person! Good luck with name picking, I know that can be stressful. Hi! Where did you get your Christ photo framed? Thanks! You look like a tall glass of pink lemonade in this outfit! I love these pops of color! Check out my stripe spring dress at http://www.awhitewalllife.com/2015/03/16/spring-stripes/. You are so cute! How does one go about looking as perfect as you? Pregnant or not you are always perfection! You look adorable in this lime green dress! Can’t wait for you to share the name! Love the pink heels, you are glowing! Wow Rach, you look gorgeous in that dress! You look amazing! I love the color of this dress!! 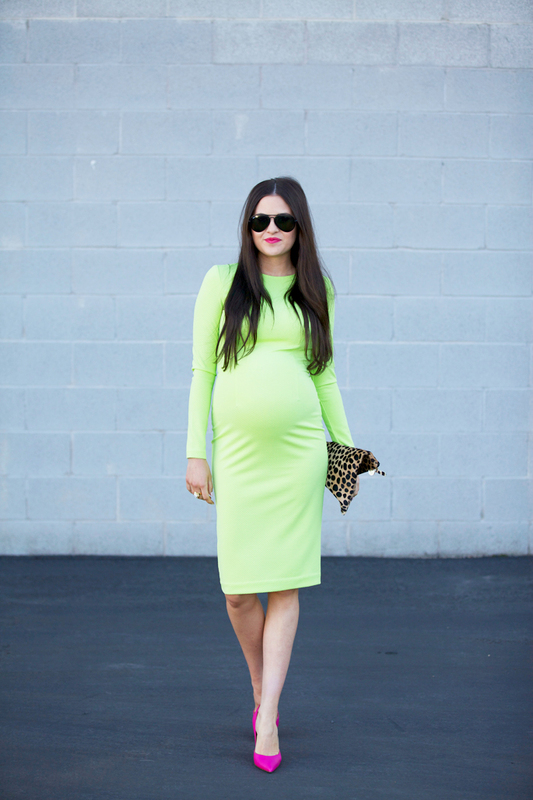 Loving the pops of neon in this look Rach! WERK! The pink shoes with the neon green are great together! You look Gorgeous! I love it! Where did you get the beautiful lime green dress ?? @Cece, it’s available on Shopbop.com! Cute baby bump! Love that dress on you! Rachel, I love your look here. I’ve had my eye on that 5th & Mercer dress for a long time, and found out recently that my husband and I are also expecting (!!!). How much did you have to size up to fit the baby bump? I want to wear the dress for a while (it’s perfect for work, events, church, etc. ), and will probably just tailor it down to my regular size 2/4 after the little one arrives. Such a stylish maternity outfit! Hey Rachel, Did you find this dress a little see through? I am trying to wear it for a baptism on Sunday and my underwear is very visible. Did you wear a slip with yours at all? Thanks!! I found Spanx work too! You are simply gorgeous and the most stylist pregnant woman ever! GORGEOUS DRESS!! LOVE THE POP OF COLOR!! I would like to suggest you my own name Pollyana! It’s a great name. I have always loved that my parents choose this name. And you Polly!